Are you desperately looking for short term intensive Photoshop Training nearby Kolkata location? We will master you in Adobe Photoshop in your desired time span. 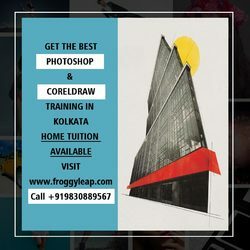 We are FroggyLeap - The best Photoshop Trainer in Kolkata. Call us at +91 9830889567 and learn about detail Photoshop Training Procedure. We bet, you will get the best Photoshop Training in the town.